ELEZIER EDWARDS - A MORMON SHOOTER AND CLUBBER and a Captain in the Iron County Militia. According to the Mountain West Digital Library, Edwards, in 1857, was the maker of gun powder in Cedar City, Utah, using native chemicals. 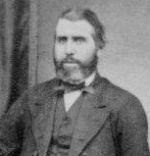 (AKA) According to The 1857 Iron County Militia Project he was known as Eleazer Edwards.